Give examples of how confidentiality can be ensured. Actions could be used such as: applying the requirements of the Data Protection Act, adhearing to the legal and workplace requirements - such as the codes of practice, recording, storing and retrieving medical and personal information. Confidentiality in health and social care settings means restricting access to information about a service user to individuals who are involved in their care, unless permission to disclose the information is given by the service user. Give different types of data storage. 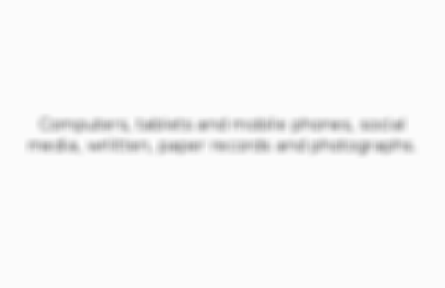 Computers, tablets and mobile phones, social media, wriitten, paper records and photographs. What is safeguarding in ensuring confidentiality? 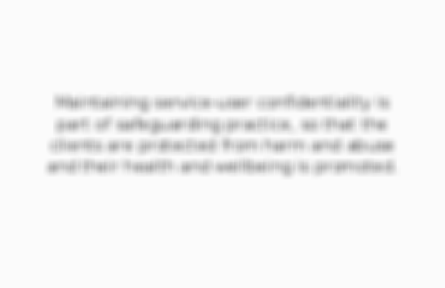 Maintaining service-user confidentiality is part of safeguarding practice, so that the clients are protected from harm and abuse and their health and wellbeing is promoted. Explain how CCTV footage helps in ensuring confidentiality. 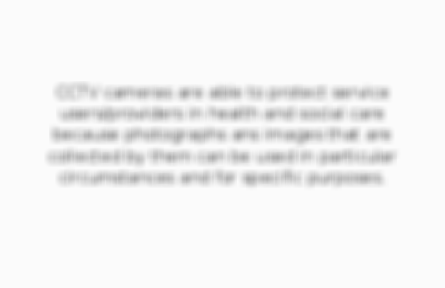 CCTV cameras are able to protect service users/providers in health and social care because photographs ans images that are collected by them can be used in particular circumstances and for specific purposes.